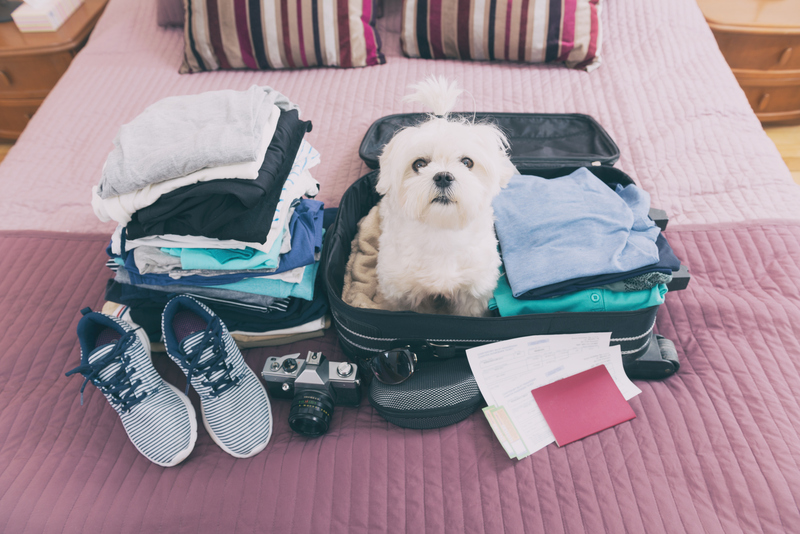 Planning for a trip can be full of arduous tasks, including packing all of your clothes neatly, arranging for transportation and coordinating your itinerary. It’s easy to become overwhelmed by it all, especially if you’re travelling on business. Fortunately, business travel experts have simplified the business behind traveling with useful tips to shorten and simplify the trip planning process. Roll clothes instead of folding – Rolling t-shirts, underwear, polos and shorts instead of folding them can help you save space in your suitcase and prevent wrinkles from forming. Use packing cubes or a similar method to separate and categorize specific clothing to access them easier. For long-sleeved, collared dress shirts, several folding tutorials are available on YouTube that can show you how to properly fold and pack them to not only save space, but prevent wrinkles as well. Read your airline’s baggage fee policy – Airlines are known for routinely changing their baggage policies without warning. Make sure to read your airline’s policy in full at least a week beforehand so you know what you can bring on the plane and how much it’ll cost for extra bags. If you have yet to purchase your ticket, read the fine print to ensure you’re at least guaranteed one free carry-on bag. Pack a spare outfit – Sometimes bags go missing, but you can prepare for the worst by packing a spare outfit. If you’re traveling on business, try to wear a business casual outfit on the plane so you have something to wear should your luggage go missing. You can also pack a simple t-shirt, underwear and pants if need be in your carry-on in case your stowed luggage is lost. Try to pack the most essential items in your carry-on that the airline allows in the cabin. 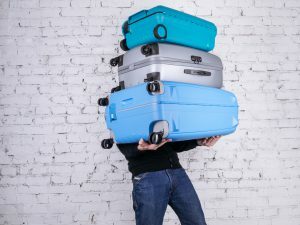 Use a lightweight suitcase – Some suitcase brands are bulkier than others, and their size doesn’t necessarily mean you get more packing space. Man holding three heavy suitcases in hand. Travel light. Choose a suitcase with a lightweight frame for your carry-on to cut down on weight requirements. Although you may want to purchase a designer suitcase, it will also attract the attention of thieves. Opt for a simple bag without brand names or labels to dissuade thieves from stealing your bag. Inform your card companies that you’re traveling – Banks take note when your card is used in another state or country, and some will often flag or freeze your card’s funds until they can identify you’re the one using it. Inform your bank of the dates you’ll be traveling and what state or country you’re staying in to avoid being flagged. Arrange for transportation ahead of time – When you need to run on schedule, it’s best to have a plan B. If you have personal transport to the airport, contact them a day beforehand to confirm the time they’re arriving. If they’re late, fall back on plan B by contacting a ride share program like Uber or Lyft to ensure you arrive at the airport on time. Examine traffic ahead of time using apps or Google Maps to find and suggest alternative routes if there are delays on the road. Of course, the biggest difference between PHX Valet and competing parking services is the customer service, attentiveness, consistency and care you receive each time you park with us. Contact PHX Valet today so you can arrive on time and in style.